Prepare yourself for an underwater adventure like no other, where you are a stranger in an even stranger world. Click here to play! 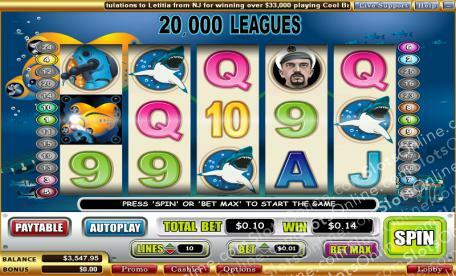 Order "down periscope" and guide your submarine through a 5-reel, 25 pay-line slot game 20,000 Leagues under the sea! You will need to master the Substitute symbols if you want to earn free spins. The easiest way to do this is to land one Submarine on any reel coupled with the 20,000 Leagues Symbol on reel 3. You will receive 10 free spins for every Submarine; that's up to 40 free spins if you get all of them! Both the Submarine and 20,000 Leagues Symbols are interchangeable and can replace any other symbol except for each other. But don't forget about the Captain! He will pay you 5000 times your original wager if you can get 5 of his Symbols to appear in one spin. So wave goodbye to dry land and strap yourself in, because you are about to experience the countless riches on offer when you are 20,000 Leagues under the sea. Both the Submarine and 20,000 Leagues Symbols are substitutes and can become any other symbol except each other. Managing to get a Submarine on reel 1, 2, 3, or 4 as well as the 20,000 Leagues Symbol on reel 3 will earn you 10 free spins per Submarine.